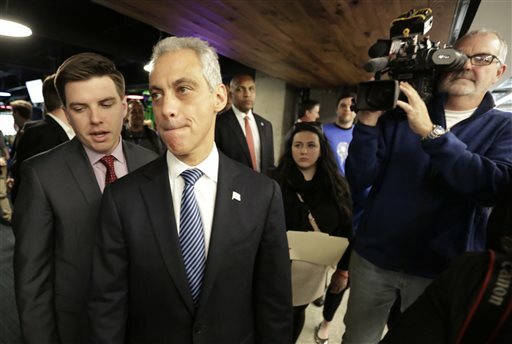 Chicago Mayor Rahm Emanuel prepares to speak to the media, Thursday, Dec. 3, 2015, in Chicago. Faced with growing calls for federal intervention after a white officer fatally shot a black teen, Mayor Rahm Emanuel said Thursday the city would welcome a Justice Department investigation of “systemic issues” in the Chicago police department. The Department of Justice&apos;s Civil Rights Division will be launching a federal investigation into whether the Chicago police department has engaged in a pattern or practice of discriminatory or unconstitutional policing, sources tell NPR&apos;s Carrie Johnson. "The U.S. Attorney in Chicago has already been investigating the death of a young man shot 16 times by a Chicago policeman last year," Carrie reports. Seventeen-year-old Laquan McDonald, who was black, was killed by white police officer Jason Van Dyke in October 2014. McDonald&apos;s death gained national prominence last month, after Van Dyke was charged with first-degree murder and a dashcam video of the shooting was released. Chicago police officers had given accounts of the killing which substantially differed from the video, according to reports released Friday. Protesters in Chicago have called for an outside investigation into the shooting, and for greater urgency from local and national leaders in addressing the case. "Illinois Attorney General Lisa Madigan, presidential candidate Hillary Clinton and the Urban League had called for a broader probe, and recently Chicago Mayor Rahm Emanuel signaled he would accept that," Carrie says. Since the release of the video, Emanuel forced Police Superintendent Garry McCarthy to resign and formed a task force to examine the department. But the calls for the mayor to resign — something he said he won&apos;t do — have grown louder from protesters in the city, including more than 200 people who shouted that he step down during a Sunday afternoon march. Protesters counted to 16 in reference to the shots fired, a number that has taken on a symbolic significance since the demonstrations began. Civil rights leader the Rev. Jesse Jackson said he was pleased with the decision to investigate Chicago. Jackson said he hoped that the investigation would focus not only on the police department, but on Emanuel&apos;s office and the Cook County State&apos;s Attorney&apos;s office, which he and others have criticized for taking so long to bring charges against Van Dyke. Emanuel initially said a federal civil rights investigation of Chicago police tactics would be "misguided." He later reversed course and said he would welcome the Justice Department&apos;s involvement — something that politicians including Democratic presidential candidate Hillary Clinton and Illinois Attorney General Lisa Madigan have called for. A spokesman for the police department referred a request for comment to Adam Collins, a spokesman for the mayor&apos;s office. "We welcome the engagement of the Department of Justice as we work to restore trust in our police department and improve our system of police accountability," Collins said. On Friday, Chicago released hundreds of pages that show police officers reported a very different version of the McDonald encounter than video shows. In the documents, police officers portray McDonald as being far more menacing than he appears in dashcam footage. That further angered activists and protesters, who were already accusing the city of a cover up. Justice Department investigations typically look for systematic violations of federal law. When it announced the Baltimore probe, the department said it would focus on issues including the use of deadly force, stops, searches, arrests and whether there is a pattern of discrimination in policing. Emanuel acknowledged "the checkered history of misconduct in the Chicago Police Department" in an opinion column published over the weekend in the Chicago Sun-Times and Chicago Tribune. "Chicago is facing a defining moment on the issues of crime and policing and the even larger issues of truth and justice," Emanuel wrote. "To meet this moment, we need to conduct a painful but honest reckoning of what went wrong — not just in one instance, but over decades." The University of Chicago said last month that an analysis by its civil rights and police accountability clinic found that of 56,000 complaints against Chicago police, only a fraction led to disciplinary action. In one of the most notorious cases of wrongdoing, dozens of men, mostly African-American, said they were subjected to torture from a Chicago police squad headed by former commander Jon Burge during the 1970s, &apos;80s and early &apos;90s, and many spent years in prison. Burge was convicted of lying about the torture and served 4½ years in prison. Of 409 shootings involving Chicago police since September 2007, only two have led to allegations against an officer being found credible, the Chicago Tribune reported, citing data from the agency that investigates police cases. Late Sunday night, the mayor&apos;s office announced that the head of that agency, the Independent Police Review Authority had resigned effective immediately. Emanuel&apos;s office said in a statement that while Scott Ando had reduced the agency&apos;s backlog of cases during his tenure, "... it has become clear that new leadership is required as we rededicate ourselves to dramatically improving our system of police accountability." Ando will be replaced by Sharon Fairly, general counsel and first deputy of the city&apos;s Office of the Inspector General and a former assistant U.S. attorney. The Associated Press&apos; Don Babwin and Eric Tucker contributed to this report.